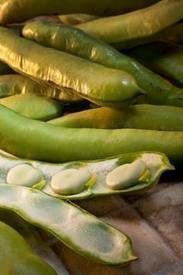 Spring has finally arrived in Rome and with it fava beans, known simply as Le Fave here. You know they’re coming a couple of weeks before they’re available because these notices begin appearing outside shops selling fresh vegetables: This establishment sells fresh fava beans. When I first noticed these signs ten years ago, I thought it meant everyone was anticipating the arrival of this venerable vegetable. I’ve since learned that there is a rare, though serious, allergy that can be triggered by inhaling the fumes released by these beans, much less eating them. Fortunately, perhaps, the condition is genetic, so you probably know if you’re vulnerable and should stay away from shops displaying the notice. But the signs still excite me because I know the treat will be here soon. 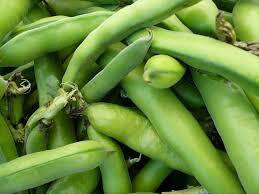 Favas were the only legumes eaten by Europeans prior to explorations of the New World. They have been a mainstay in the diets of Asians, Europeans, Middle Easterners, and North Africans for centuries, and it’s believed that North Africans may have begun eating them as early as 6,000 BC. Known by many names—broad beans, Windsor beans, field beans, or bell beans—favas are a harbinger of spring wherever they’re grown. In Rome, May 1 celebrations—Labor Day here—include raw fava beans and pecorino cheese. But the real spring treat is vignarola, a medley of vegetables available concurrently as the weather warms: artichokes (just ending the season), favas, and peas. It’s a labor-intensive dish best prepared while seated at a table outdoors, accompanied by a friend and a glass of white wine. You can shell the legumes and clean the artichokes while enjoying the sunshine. When all the vegetables have been preped, move indoors for the cooking. 1. Heat the olive oil in a frying pan and add the bacon, cooking and stirring until it begins to brown (if you’re omitting the bacon, move to step 2). 2. Add the spring onions; cook until they soften. 3. Add the artichokes, Romaine, salt, and pepper. Stir well and cover. Reduce heat to lowest setting and cook about 10 minutes. 4. Stir in the peas and favas. Cook an additional 15 to 20 minutes, until the vegetables are tender. 5. Serve warm or hot. It can be a starter course or a main dish. It also works well as a sauce for pasta.